SK YEE HEALTHY LIFE CENTRE BY RONALD LU & PARTNERS Archi-new - Free Dwg file Blocks Cad autocad architecture. Archi-new 3D Dwg - Free Dwg file Blocks Cad autocad architecture. The Healthy Living Centre SK Yee is a small but significant project. Ronald Lu & Partners (RLP) completed the architectural design including interior fit for a roof construction of a 380 square meter light structure. SK Yee healthy life CentreIts "lean and green" design allows the Healthy Living Centre SK Yee to provide more of a healing environment - but also acts as a house, a garden and a playground for patients. The tranquil location on the roof offers an atmosphere of calm and serenity in all patients immersion in nature and the light of day and offer them a limitation of the healing experience. Demonstrates an exceptional example of the integration of sustainable design in the healthcare architecture. The concept is simple but profound - the building incorporates a number of green elements, starting with its steel structure of light and design features low carbon content. The concept of "push" informs the layout of the interior space, consulting room in each functional area and attached to a garden, creating a constant interaction between inside and outside; light and the continued development of air into the structure. The structure is modest, but at the same time rich. The center is at 100 percent natural light and ventilation. The interior was designed with cross ventilation windows that allow patients to have control over their environment, creating a place of comfort, respect and dignity. The interiors naturally ventilated greatly improve the quality of indoor air, the promotion of a healthy indoor environment that brings additional benefits under carbon. Green is widespread throughout the Centre. Its roof and wall design creates an integrated green vegetation index covers more than 57 percent. 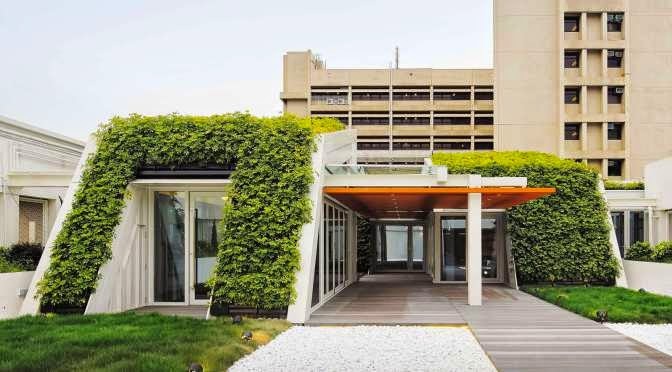 Its extensive green roofs and walls not only reduce the air conditioning load, but also offer a landscape that patients and close neighbors can enjoy. This outdoor landscape fits perfectly in harmony with the interior, creating a stress-free experience for patients. With a number of spaces and unusual plants under the sloping ceilings and a playful interior with plenty of natural ventilation and daylight, the center offers a unique atmosphere and fun tips for children. Slide the house creates a wonderful and immediate interaction between interior and exterior spaces. The Centre is a showcase of sustainable and healthy architecture which is very important for health professionals and patients. The opening of a new chapter in the architecture of healing, health professionals were actively involved in the project design, the oldest design. This participation has helped to create a peaceful atmosphere immersed in light and air, which helps to alleviate patient anxiety and becomes an empty space in a full sense of serenity and space, finally. Source Ronald Lu & Partners. Building Services Engineer: Far East Consulting Engineers Ltd. Contractor: EDM Construction Company Ltd.